There is definitely a brow thing going on right now with highstreet brands and Rimmel, who have already released some new products which I reviewed here have added some more products to their collection with the Rimmel Brow Shake Filling Powders. Described as being "Long lasting, ultra soft brow filling powder that doubles up as an eyeliner for an impactful eye look. Line, define and fill for a WOW brow" these powders are available in 4 shades - Light Brown, Medium Brown, Dark Brown and Soft Black and they retail for £5.99 each (though currently on offer in both Boots and Superdrug). The Rimmel Brow Shake Filling Powder is not quite like any other brow products I have comes across. Firstly it is packaged within a pot and it features a long conical shaped lid so it is easy to grasp and hold and secondly it is a loose powder, something I have used from a pot rather than a tube. When it comes to using, the very first thing you need to do is to shake the entire tube for a few seconds before you would use it and as you shake it, you get a clicking sound. The shaking of the tube allows the loose powder to cling to the sponge applicator, again something I have never used before. Once it has been shaken there should now be enough product on the sponge applicator, something I expected to really dislike but actually I do like it and find it incredibly easy to use but and yes there are two, because of the way you apply the powder to your brows, you aren't able to create hair like strokes as you might do with your pencil or wax and it did take some getting used too and secondly it is a loose powder so there is some fall out, admittedly not as much as I had expected and tapping the brush before using also helps. The powder in the tube is not only loose powder but it is also really pigmented giving quite an intense colour which is designed to last all day and night. Once on the brow the colour does not budge or smudge and as the formula is waterproof, so you will need to use makeup remover to remove it. My brows are pretty rubbish, after years of over plucking, I am not blessed with thick bushy brows, but they are very slowly growing back and I have to work with what I have got. I do use brow products from Benefit so with these four shades I am somewhere between the light and medium brown shades and I hope there will be some more shades added to the range. Overall I do like the brow powder. It is easy to use, easy to apply, is great for brow filling and it definitely does not budge wants applied, which is pretty impressive and all for just £5.99. Have you tried these Brow Powders from Rimmel? Thanks for reviewing Rimmel Brow Shake Filling Powders which is newly launched in the market. And I am sure it will be loved by the girls as it is long lasting as well as its ultra-soft brow filling powder which doubles up as an eyeliner for an impactful eye look. I am sure my girl students assignment help in UK from me as I am assignment writer at Quality Dissertation and love to try this new products soon. I'm pretty low maintenance with my brows so these are perfect for simply filling in the gaps plus I find them quite long lasting. Glad they work for you! I don't fill in my brows anymore but I don;t think these would eb for me as I prefer hair strokes. I do like a very defined brow so I think these would work to use on top to fill in any gaps. I hadn't heard of these brow powders before, so will look out for them when my Gimme Brow runs out! I've never tried these before, but I've always heard Rimmel makes great products. 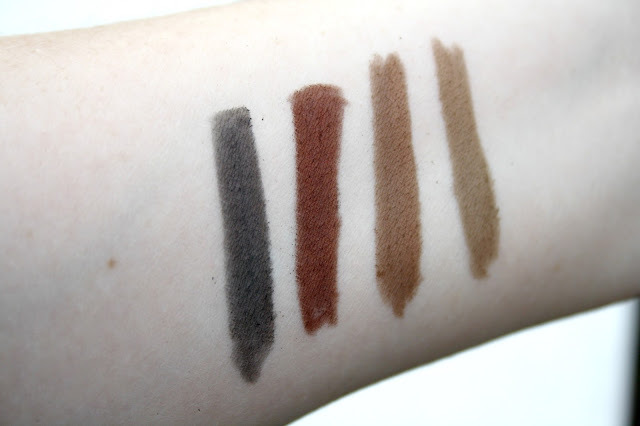 It is great that the brow powder stays on and you can see by the swatches that it is highly pigmented too! Ever since I've seen these I've been very unsure, but you have now made me want to pick it up to at least give it ago. I like the sound of how quick and easy it is. This sounds really interesting although possibly too much hassle for me! I am looking forward to try these out - I prefer pencils but always open to other brow products! I keep seeing these everywhere and the TV advert is making me want to try them even more! I love brow products too more than anything else really, so need to try these asap! I've never used a filling powder before. Glad to hear it's well pigmented as that means it will work well. I found that there was a bit of fall out with these but I do really like them! Brow powders are by far my favourite way to fill in my brows. I will look out for these on my next Boots visit. Thanks for the great review. I saw an ad for these the other day and was half considering trying it. Good point about the range of colours though - I'm not sure what would suit me. Maybe I should wait until they have added some more to the range. Oooh, nice dense shades. My brows are pretty thick, but I think I'd still rather like to try these as it looks like I could just sweep and go. this one looks a bit like the new brow filler from maybelline, i love it and would love to try this one too after your review! I keep seeing the advert for this and it looks so quick and easy. I haven't tried these but am actually on the lookout for a new brow powder, so will definitely be trying these! This is a really interesting product. Unfortunately I think I would be between shades. The black is of course very dark, but the brown looks much too warm for me. I hope they add more shades to the range!